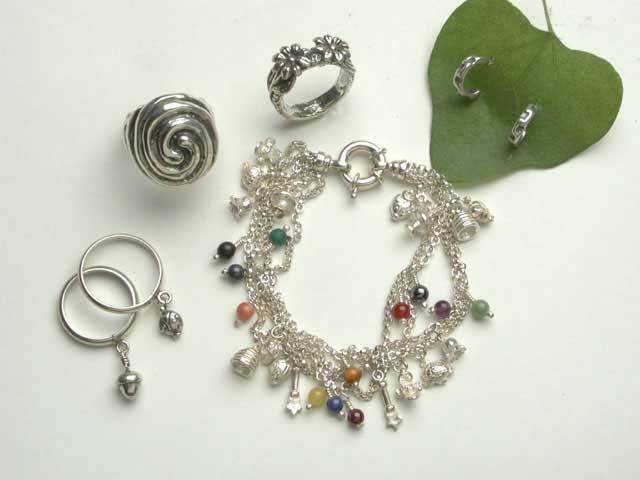 Straight from a treasure chest a faerie brings together some of her favorite things. 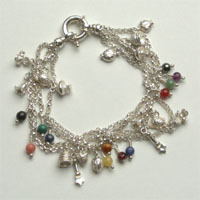 Each bracelet she makes is unique. Some of the treasures she may include are pretty stones, tiny magic wands, honey bees, beehives, turtles, acorns, walnuts, butterflies, dragonflies, mushrooms, strawberries, lilies-of-the-valley and ladybugs. The price of gold has changed so much that I can't keep the site up to date. Please call for a quote. Inspired by faeries, this ring is available to fit mortals. The faerie smiths created this ring as thin as a cherry stem and cast each tiny acorn from the faerie forest. The price has changed so much that I can't keep the site up to date. Please call for a quote. 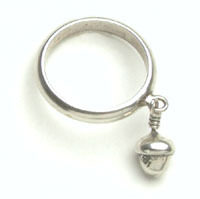 This human size ring, which is thin as a cherry stem, can be stacked with the Acorn Dangle Ring and other dangle rings to come. 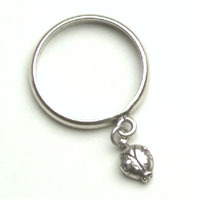 The Ladybug Dangle Ring is fun to wear when you're wearing the Ladybug Dangle on your necklace. 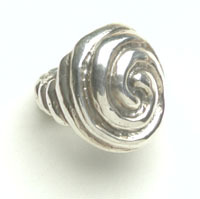 The Double Spiral Ring is substantial and powerful. Wearing it connects you with your inner power and brings it to the surface. This is the largest flower garland ring that the faeries make. 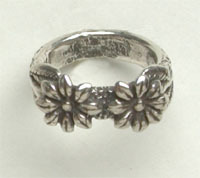 It is a double flower design inspired by the fullness of late autumn harvests, captured at their peak in sterling silver. 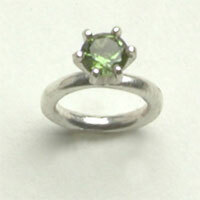 August's birthstone Faerie Ring is the warm green of the peridot. Born at the end of summer, August babies are surrounded with the full rich green of summer and the touch gold of autumn, creating this amazing colour. These fairie size rings are beautiful on an Faerie Rings necklace. This Faerie Ring is approximately 1/2 inch. This pattern is found throughout many cultures from around the world and is especially loved in ancient Greece and Egypt where it adorns walls and ceilings. 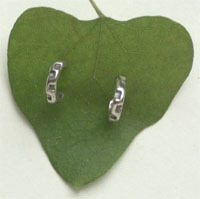 This earring design is also available in the form of a tiny Faerie Ring from your retailers. These Faerie Ring earrings are 1/2 inch.